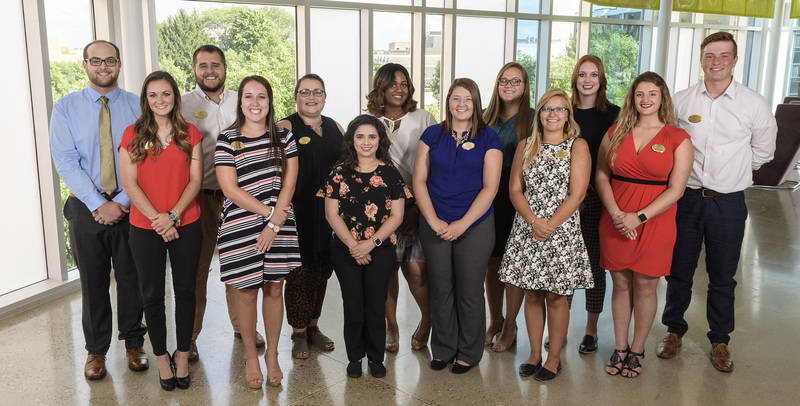 The mission of the Dean's Student Advisory Board (DSAB) is to empower and advocate for the students of the College of Education and Human Services. DSAB students meet monthly with the Dean of CEHS, Joseph Keferl, in order to collaborate with college leadership, to assist in meeting college goals, and to share ideas about how to best support student success. DSAB also plans events throughout the academic year focused on the group's objectives outlined below. To inspire and empower students to invest in academic success and community leadership. To build and sustain past, present, and future relationships in our Wright State and local communities. To create a student culture of philanthropy, continuity, communication, and service. To listen to and advocate for current and perspective students of CEHS. We are now accepting applications and resumes for open DSAB positions for the 2019-2020 academic year. Applications and resume submissions are due by Friday, March 22, 2019. The DSAB members will then select candidates to invite for an interview in April. We look forward to meeting interested students, and selecting our new members! Want to learn more about becoming a DSAB member? Attend one of our upcoming information sessions! Meet our 2018-2019 Dean's Student Advisory Board members! Hello! My name is Tessler Baird. I am a Junior majoring in Early Childhood Education, minoring in Youth and Community Engagement and wish to add a 4-5 endorsement onto my education as well. Hi, my name is Julia Copfer and I am a Junior Early Childhood Education major in the College of Education and Human Services. I started my college experience by playing on the Wright State University’s Women’s Basketball team. Hello, my name is Ryan Dryden. I am currently a Sports Science major here at Wright State University. After my time at Wright State, I intend to go to physical therapy school. Hello, my name is Keri Eagle and I am a Junior majoring in Early Childhood Education. I am from Riverside, OH, and I am the oldest of three children. Hello, my name is Becca Endicott and I am a Rehabilitation Services major here at Wright State University. After receiving my undergraduate degree, my goal is to attend graduate school to pursue a career as an Occupational Therapist. Hi, my name is Chloe Flitcraft. I am a Middle Childhood Education major here at Wright State University. After receiving my undergraduate degree and master’s degree, I hope to teach 4th, 5th or 6th grade. Hi, my name is Katie Howard and I am a Senior, Sports Science student in the College of Education and Human Services. I also have a Pre- Physical Therapy focus and am currently enrolled in the honors program. Hello to all, my name is Jazmyn Maxwell and I am currently a Senior majoring in Middle Childhood education at Wright State University. Hello! My name is Bekah Muchmore and I am a second-year graduate assistant and student in the Masters of Leadership Development program in the Leadership Studies Department. My name is Lindsey Strickland and I am a Senior in the Rehabilitation Services program and I also have a minor in Veteran Services. Hello everyone! My name is Michael Tope. I am a senior majoring in Rehabilitation Services in the College of Education and Human Services. Originally from Paulding, Ohio, I moved to Dayton in 2015 to attend Wright State University. Hello! My name is Kathryn Watson. I am a senior majoring in Early Childhood Education. After obtaining my degree and teaching license I plan to begin teaching in my own classroom and start working towards earning my Master’s degree. Hello, my name is Shaun Wenrick and I am an Early Childhood Education major. This is my fourth year at Wright State. Do you have a comment, question, or suggestion that you would like to share the CEHS Dean’s Student Advisory Board? Then this is the place to do it! Our mission is to be the voice of and advocate for our fellow CEHS students. Your ideas, concerns, and questions are central to this mission, so please take a few moments and share your thoughts. If you'd like to receive a follow up response, where appropriate, please provide your email address. We might feel your suggestion has wider appeal and would benefit our entire CEHS community. Would you be willing to let us share your suggestion with other CEHS faculty/staff/leadership/students? (We will not share your name or email address).